Sonal: OMG!! what sort of dance are they doing? love it!! and sridevi in her prime!! Nehal: I think that this jam is on one of the greatest compilations I own... a little something entitled the 'Rarest and Sweetest'. Great tune. I didn't know that this was the '80s. These outfits currently exist in our wardrobe. Reetu and I performed this at home last night. G: Why aren't those rockin' sleeveless shirts still fashionable dammit?!? G - if we look in nehal's closet we will see that sleeveless shirts are not only still fashionable, they are still being worn. From the 1984 movie 'Inquillab' about being bitten by a scorpion and equating it to falling in love. The song is just dandy and sung with great gusto by Kishore & Asha. 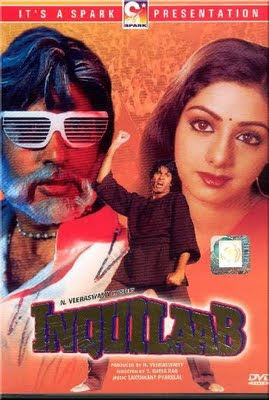 The movie never was a huge hit but combined with the cheez fashion, cheez lyrics (complete with subtitles), cheez dancing and of course 2 of the biggest stars in Bollywood history, it's been one of my favorites through the years. And as an added bonus I believe Beth (from Beth Loves Bollywood) stayed at the resort where this was filmed! Guys this is the brand new video from the movie Acid factory. ENTER THE CONTEST FROM http://bit.ly/16PHPQ and WIN THE ACID FACTORY AUDIO CD, HURRY! I absolutely love it! The music, the lyrics, the dancing, everything. Sridevi looks amazing and AB is in fine form. And your reponses to the comments by 'fans of the song' are great too. Also - I want to move in with Nehal and Reetu!